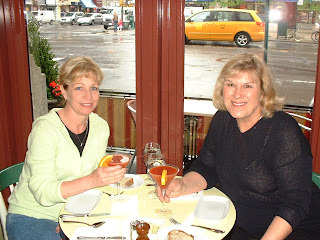 My friend Jan and I were fortunate to be able to spend a long weekend in the Big Apple last weekend. We had gotten a great Northwest airfare of $122 (RT) from Detroit and were booked into the Lucerne on the Upper West Side at $169 a night for a room with two beds, booked directly through the hotel. Upon arrival at LaGuardia our luggage beat us to the carousel and within minutes we were outside in the cab line. Our first (and only) mistake: we should have waited for one of those cabs instead of accepting an offer from an independent. He quoted $40, (which is too much - I know now) but since we were splitting the cost, it didn't seem too bad. He said it would be more than I thought because our destination was the Upper West Side. He then lead us to the parking lot and into an unmarked car - not even a regular yellow cab. When I questioned this, he did point out the NY Transportation registration sticker on his windshield. By this time, we just thought "whatever" and got in. A young woman was standing nearby looking for a cab and we invited her to join us, thinking we could split the cost. At the hotel, he added the cost of the bridge toll, and told me he needed $44. In the meantime, he unloaded our luggage and the hotel porter loaded it onto a cart and took it inside. Later in the room we were shocked to realize he had unloaded the other passenger's suitcase, instead of Jan's! The stranger's suitcase did not have a name tag on it and we had no receipt or identification for the car which had just dropped us off. This comedy of errors made us feel like The Country Bumpkins Meet the Big City! (Remember the movie with Jack Lemmon and Sandy Dennis?) It did end OK though, since my friend had her name and phone number on her luggage. One nervous hour later they called her cell phone and came back to our hotel for the switch. We were so pleased with the Lucerne. I had done a lot of agonizing over this choice. We didn't want to spend a bundle but still have certain standards with regard to cleanliness, location, etc. 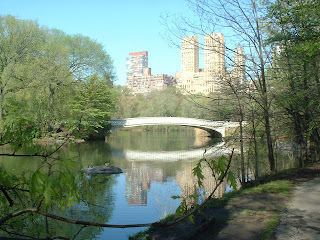 The location was ideal because our main objective this trip was Central Park. (My friend was running a race on Sunday.) The service was impeccable as was the cleanliness. I had requested a corner room, which unfortunately was not available when we checked in, but we were on the 11th floor with a view uptown. The room also was a decent size with two queen beds and a bathroom with a tub/shower. The best part of the hotel was Nice Matin, the French restaurant accessed from the lobby, our first stop after unpacking. The cheery decor and outdoor seating area with its red awnings reminded me so much of Paris. Our affable waiter suggested a blood orange martini which became our signature drink for the weekend. A drink and a few appetisers later we were good to go on our first exploration of the area. Our meanderings took us into the park at dusk. The spring weather was so nice there were many people there, walking, jogging, walking their dogs, fishing, smooching. That is just what we had hoped to experience - how the locals live. We were enchanted by Tavern on the Green at night. Although we did not dine here we boldly walked in an explored the whole restaurant. In the courtyard the trees were decorated with hundred of electrified Chinese lanterns. My friend who has five grown daughters fantasized about having weddings here. We were wowed by the spectacular Tifany windows and lights. Even the scent of the hand lotion in the restroom impressed us! We ended up having another cocktail in the upstairs bar. We were back at the park early Saturday morning again for our early morning walk. The sun was shining and there was not a cloud in the sky. 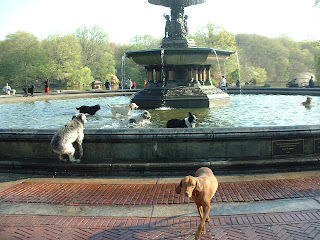 Our favorite spot was Bethesda fountain, watching everybody with their dogs. The dogs expressed what we were feeling: sheer jubilation. As the owners turned them loose from their leashes, they raced down the steps and sailed into the water. I'm a cat person, but I almost wanted to rent a dog for the occasion. There were so many different breeds and they all looked so happy to see each other again. We exited the park at the Strawberry Fields memorial, which had been beautifully decorated with rose petals. This memorial to John Lennon is a place where tributes are paid to people in the music industry when they pass on. I was shocked to find myself teary here. Of course, we had to walk past the Dakota where the horrific shooting took place. After the park we meandered through an a street fair and ended up at Sarabeth's Kitchen for breakfast. This began the first of many times when we got seated without waiting and shortly afterward there would be a huge line of people. Timing is everything! It was a beautiful day to sit outside and our breakfast and the service was perfect. Jan needed to pick up her race packet so after showering and changing we headed through the park over to the Upper East Side. I was born in Austria, so I was interested in the Neue Gallerie with it's Klimt paintings. The building itself is worth seeing, one of the most distinguished buildings on Fifth Avenue. There were only a handful of Klimt artworks, which were beautiful, but the rest of the art was not my favorite. I find German art in general to be so depressing. In short order we found ourselves seated in the museum's Cafe Sabarsky having very STRONG, but great, coffee served on a silver tray with whipped cream and we split a piece of authentic Viennese Sacher Torte. The wood paneled room was beautiful and comfortable with Austrian and German newspapers strewn on the Bosendorfer grand piano and a huge bouquet of apple blossoms lending a cheery atmosphere. Our pre-theater dinner was at the Grand Central Terminal Oyster Bar. It has been a New York institution since 1913. The historic terminal itself is a great place to be and we enjoyed our meal of yellowfin tuna and scallops. We have found the service and friendliness everywhere to be exceptional. Certainly not what we expected, considering what we have read in other sources. We had tickets to "Wicked" at the Gershwin Theater and had plenty of time to settle in and anticipate. It totally exceeded our expectations! What a lot of fun this was. The plot is so clever (a prequel to the Wizard of Oz) and there are a lot of funny inside jokes. Chenowith is astounding and Menzel keeps right up with her. Highly recommended! We needed to get back to the hotel so my friend could rest up for the race in the morning. It's true - it's hard to get a cab after the theater. We finally did get one, but had to walk a bit. I don't know how to do that whistle and my polite Michigan wave doesn't always get their attention. Sunday dawned cooler, but we were soon warmed by our jaunt over to the park (again) for the race. It was a fun atmosphere watching as the thousands of people of all shapes and sizes geared up for the four mile run. I was so proud of Jan for doing so well and she was elated at being able to run her best time yet. She has run in a lot of places, but she will always remember being able to run in Central Park. On the way back to the hotel we had fun browsing the Greenflea Market until it started to sprinkle. Breakfast this morning was at Isabella's - another winner thanks to the folks here on this forum. The rest of the day was spent dodging raindrops. We wanted to walk the Brooklyn Bridge but by this time it was raining too hard and we scrapped the idea. We ended up moseying through Chinatown and Little Italy. If you are looking for cheap NY t-shirts to bring back as souvenirs, Chinatown is the place. I got 8 NYPD shirts for $2 apiece. In Little Italy we had to stop in at Taormina's restaurant since this is Jan's maiden name. When we told the bartender, he promptly bought us a drink. Before long we were chatting with the two other couples at the bar. The guys were firefighters from Boston, with their wives. This unplanned stop became a cherished highlight of our trip. We took a cab to the New Amsterdam theater for "The Lion King". The music is joyful and life-affirming and we were extremely impressed with the creativity of the costume design. We hadn't really eaten since breakfast, so it was time for some solid food. Nearby was Don't Tell Mama, a cabaret often frequented by Nathan Lane, et al, but not much was going on. We had planned on Firebird, but unfortunately by the time we got there they were not serving anymore. They did allow us to walk through and check it out. It is such a beautiful space and will definitely merit a visit the next chance we get. They recommended an Italian spot just a few doors down and we were able to get our dinner orders in just before the kitchen closed. A note to self: even New York shuts down early on Sunday night. It was raining hard by the time we came out. Miraculously, a cab appeared, but did not stop for me (even though by this time I was practicing a more forceful signal). A screeching whistle from a helpful guy who exited the restaurant with us stopped him and we gratefully caught a ride back to the hotel. A side note: When we got out of the theater there were angry demonstrations going on in Times Square by black muslim groups and police were everywhere. Some people were shouting back and it looked like it could get violent. Quite a contrast to what we had just seen on stage! Monday morning dawned rainy again and we used our 25% off coupon to have breakfast at Nice Matin adjoining the hotel. After breakfast we walked over to Broadway, stopped in at Filene's Basement, and spent a lot of time at Zabar's. I bought a lot of goodies to bring home and picked up a half dozen hot bagels at H&H to bring to hubby. Then it was back to the hotel to pack and take our (sadder but wiser) $18 cab ride back to LaGuardia. In summation: We loved staying at the Lucerne and would happily do so each subsequent visit to New York. The location is peaceful, the service was great and the room and bed were comfortable. The shops and restaurants in this area are affordable and plentiful. Nothing too chi-chi here, but that is a plus in my book. I would never want to be at a hotel in Times Square! I had many so many plans to see so many things, and as usual, most of them went out the window as we made time for unexpected discoveries. I am already looking forward to my next adventure in this great city.